Annual shortfall roars past company record, as quarter loss comes in wider than expected; larger operating losses ahead. NEW YORK (CNNMoney.com) -- Ford Motor Co. reported the largest annual loss in company history Thursday. The embattled automaker also posted a fourth-quarter loss that was worse than analysts' expectations and warned of worse showings ahead. Weak sales of its key pickup trucks in the quarter and $9.9 billion in after-tax charges due to employee buyouts and plant closing plans resulted in $12.7 billion loss for 2006. Weak sales of the Ford's best-selling F-series pickup truck helped cause a bigger than forecast loss at the embattled automaker. That works out to a loss of just over $24,000 a minute throughout the course of the year, or about the price of a Ford Mustang. As bad as the financial report was, it did not shock Wall Street. Shares of Ford (up $0.26 to $8.46, Charts) gained about 3 percent in morning, as revenue came in slightly better than forecasts, and company officials offered more details of the results on a conference call. "We know where we are, we're dealing with it and we're on plan," said Ford CEO Alan Mulally about the company's turnaround plans. Mulally faced numerous questions from reporters during the call about plans by Ford to again start paying bonuses to white-collar employees despite the losses, and whether that would make it difficult to win further concessions it will be seeking from the United Auto Workers union. The Wall Street Journal reported Thursday that union concerns about the bonuses could hurt negotiations. Mulally said no decision had yet been made about executive bonuses, but he confirmed it is something Ford is looking at and defended the idea of paying the bonuses, even at a time of record losses. He said Ford needed to makes sure pay for all its employees, both salaried and hourly, was competitive so that it did not lose the people it needs to execute the turnaround. "We use the word bonus, but it is a key piece of their compensation, and that's how we pay them for the performance they're achieving," he said. "We need the absolute best-skilled and motivated team in all of the positions"
The UAW is in the process of negotiating some plant-by-plant contracts with Ford as the company weighs which plants it will close in coming years. And the union's companywide contract with Ford and the other Detroit automakers expires in September. Mulally said he's been pleased by the tone of negotiations with the union since he got to the company in September and is confident the union leadership is also committed to making the changes needed to stop the losses. "I am very pleased...with the UAW's response in working all the elements to improve our productivity," he said. The company has seen a big drop in consumer demand for its key products, such as the F-series pickups. While still the nation's best-selling vehicle, the pickup saw sales plunge by more than 100,000 in 2006 in the face of record fuel prices and a slump in the housing market, which cut demand from contractors. As the higher fuel prices drove Americans back to car models, Ford was left with a weak product lineup. Its Taurus sedan, once the nation's best-selling car, was discontinued in 2006 after years of seeing most of the demand for the model come from rental car companies. It also got out of the business of making minivans last year as it struggled to play catch-up in the hot "crossover" segment that provides buyers with a more car-like drive for a larger family vehicle. The shift in buyers' preference left Ford with numerous truck factories that were idle much of the quarter, even as unionized hourly workers continued to be paid near full salary. It responded to the downturn by offering all 75,000 of its U.S. factory workers buyouts or enhanced retirement packages to leave the company, which more than half of them agreed to do. Most of the charges related to those downsizing efforts. The 2006 loss compares to restated net income of $1.4 billion in 2005, when earnings from its credit unit overcame auto losses. The company's prior worst loss on record was 1992, when a charge for a change in accounting practices led to a net loss of $7.4 billion. The last time the company posted a full-year loss was 2002. Losses excluding special items, such as the buyouts and plant closing charges, came to $2.8 billion for the year, or $1.50 a share. That compares with a earnings of $1.9 billion, or $1 a share on that basis a year earlier. And while the company said the lack of large special charges should trim its net loss this year, it warned that losses excluding special items would be worse this year than in 2006. It did not give any specific range for that loss in its financial statement. The company's larger operating losses in 2006 came even as it trimmed $1.4 billion in costs during the year on savings in its retiree health care program from the UAW and from a decline in both its hourly and white collar staff. Even with the changes in the health care plans, the company spent $3.1 billion on U.S. health care in 2006, or an average of about $1,200 per vehicle, putting it at a cost disadvantage with some overseas automakers who have health care costs of workers building imported vehicles paid by foreign governments. A report in the Wall Street Journal earlier this week said Ford and the other Detroit automakers were looking at funding union-controlled trust funds with billions in cash and equities in order to shift the responsibility for future retiree health care costs away from the companies to the union. Mulally said no decision had been made on such a plan, but said that the company was looking at similar labor deals at other companies, such as Goodyear Rubber & Tire (Charts), which he referred to as innovative. "In our dialogue we have everything on the table," he said. Even with the cost savings already achieved, the drop in sales volume cost it $3.3 billion compared to 2005, and lower pricing on the vehicles it did sell cost another $1.9 billion. For the fourth quarter, Ford posted a loss from continuing operations of $2.1 billion, or $1.10 a share, excluding special items. That compares to a profit of $285 million, or 15 cents per share, a year earlier, again on earnings from the credit operations. Ford ended the year with 37,700 salaried employees in North America, down almost 5,000 from a year earlier, and 77,900 hourly employees in the region, down nearly 8,000 from a year earlier. It plans to cut another 18,000 to 23,000 hourly positions and 9,000 salaried jobs by 2008. Analysts surveyed by earnings tracker First Call had forecast a loss of $1.01 a share, with estimates ranging from a loss of 75 cents a share to $1.52. Revenue for the quarter was $40.3 billion, down $6 billion from a year earlier, as auto revenue fell $4.7 billion to $36 billion. First Call had been forecasting auto revenue of $34.7 billion for the period. 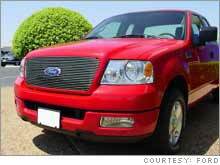 Ford, which had long been the nation's No. 2 automaker behind General Motors (Charts), fell behind Toyota Motor (Charts) in U.S. market share in the fourth quarter, and even fell behind DaimlerChrysler (Charts) in U.S. sales in November. GM and DaimlerChrysler's Chrysler Group are also expected to post losses in the fourth quarter, as they lose market share to Japanese automakers such as Toyota and Honda Motor (Charts).